Deep sea fishes remove and store more than one million tonnes of CO2 from UK and Irish surface waters every year, according to a new study led by the University of Southampton. This natural carbon capture and storage scheme could store carbon equivalent to £10 million per year in carbon credits. Fish living in deep waters on the continental slope around the UK play an important role carrying carbon from the surface to the seafloor. It is assumed that deep water fishes all depend on particles that fall from the surface for their energy. 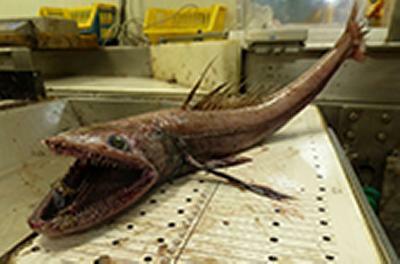 These bottom-living deep water fishes never come to the surface and the carbon in their bodies stays at the seafloor. However, at mid-slope depths there is an abundant and diverse ecosystem where a huge volume of animals make daily vertical migrations to feed at the surface during the night. The animals conducting this migration then transport nutrients from the surface back to the deep. Researchers from the University of Southampton and Marine Institute, Ireland used novel biochemical tracers to piece together the diets of deep-water fish revealing their role in transferring carbon to the ocean depths. They found that more than half of all the fishes living on the seafloor get their energy from animals that otherwise go back to the surface, and not from settling particles. These bottom-living fishes therefore become a carbon capture and storage facility. Global peaks in abundance and biomass of animals at mid slope depths occur because this is the depth range where the vertically migrating animals are most easily captured by fishes that live at or near the seafloor.